+ What does it involve? The bike fit takes around 3 hours. We will talk about you first: you can detail why you are coming and any issues or discomforts you want to address. We'll get an idea of your riding history, injury history, cycling and bike fitting goals. This will flow into the physical evaluation. We will look at strength, flexibility, posture, range of movement and assess you feet in lots of detail. This is will give us a good idea as to why you might be experiencing any specific issues before you get on the bike. We then make the orthotics via a heat moulding process. While these are setting we measure your current bike setup and cleat position. We then take a look at you riding your current position at varying levels of intensity on our adjustable jig and take slow motion video from differing viewpoints. A major benefit of working with our adjustable jig is that we can make changes while you are pedalling. You can experience the difference immediately. The position is adjusted as necessary and we install the orthotics taking detailed 240fps slow motion video as we go. We will look at saddle and cleat position, assess the need for and install cleat stacking and or wedging and get the knee tracking and pelvic stability as good as possible. We look at your posture on the bike and analyse your pedal stroke. You will receive coaching and instruction on how to improve these going forward if applicable. Handle bar X and Y will be set, handle bar rotation, lever position and lever reach adjusted to make sure you are safe and comfortable in all riding positions. We will also look at saddle selection, crank length and pedal axle width. At all stages we will explain why we are making the changes we are and how they may relate back to your fitting goals or issues. + I'm about to buy a bespoke frame and thought a bike fit would be a good first step? Perfect. We would advise having a fit a few months before you want to order. This allows us to really nail the position and component choices. Ideally you road test the position on your current ride and we look at how you may want to change the handling and ride qualities. 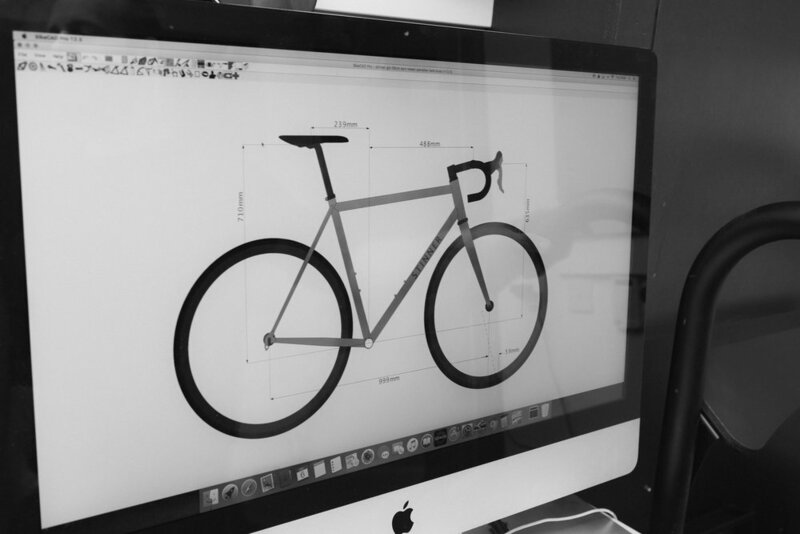 We can then design you a frame geometry based on your requirements for you to take to your frame builder. We are also happy to liaise with the frame builder to discuss the frame design. We have competed bike fits and frame designs for some of the worlds leading bike manufacturers. If you want us to build up your new frame and set it to your fit measurements, we would refund the fitting costs if the components we supply total above £3,000. Workshop labour is £250 for a bike build. + I've got a big event coming up, when should I get a fitting? Ideally a month or two before. We could be looking at large changes to position and in some cases it can take the body a while to adjust. We could potentially change your weight distribution on the bike and therefore it could therefore feel unfamiliar to handle at first. It is also good to allow time to return for any tweaks after road testing the position for a good few hundred miles. If your knees are killing you and you've got the Maratona coming up please give us a chance to fix them, don't book in the day before you fly! Yourself, your bike, close fitting summer Lycra kit and cycling socks and shoes. We need to see your knees and markers will be stuck into your clothing so we don't want fabric flapping around. Ideally your shoes should be a good fit with room to wiggle the ties inside. If you have locking skewers on your bike, bring the key. If your bike is clean and functioning well, that would be good! + Will all the parts on my bike need changing? It is likely that you will be advised to change a component or two. Saddle, stem, bars, pedals, cranks are common swaps. We will always aim to keep you informed of costs, options and benefits of change as we go along. + What other costs might I incur? Cleat wedges or shims are a common but inexpensive addition. There will be a workshop labour charge if we need to recable your bike due to a significant setup or component change. + Can you help me choose a new bike? Most definitely. If you are looking at a specific new bike of any brand we can get your final fit position drawn up onto the most appropriate size showing you how the fit should be achieved in terms of stem size, spacers etc. If you are undecided between sizes we can demonstrate the differences both in setup and handling. We can also help to advise on which bikes might suit your position and needs if you are after more broad guidance. If you purchase a new bike from us over £3,000 we will refund your fitting costs. + Why do I want cycling orthotics? When cycling you are asking your body to do something unnatural to its design. The orthotics fill the gaps between the sole of your feet and the shoe, making the foot the rigid lever that cycling ideally desires. They can help solve a number of foot, knee and saddle related complaints. If you don't have control of the foot during the pedal strike you end up with unwanted consequences further up the kinetic chain that generally get amplified the further they travel. A lot of saddle issues stem from the feet! Distributing load throughout the foot can help to alleviate most pressure related complaints. Careful wedging also helps. The two are prescribed in tandem. We include the custom orthotics for free in our fits as they make such a profound difference to most cyclists and make my job that bit easier. It's best just to do it from the word go. As as standalone service, bring your cycling shoes with original insoles and we can make you a pair in around 30-45 mins. If you want to bring your bike to test them after, you are more than welcome too but this is not essential. We also offer a discounted saddle & cleat setup plus orthotics package. ONE PRO CYCLING powerhouse sprinter Chris Opie had this to say about his..
"I have to say, I'm absolutely loving the orthotics. I've even started using one set in my mtb shoes, as I was curious if it would help cure the increased pain and fatigue I had in my arches there too. I really could not be happier with them!" + What is your fit methodology and experience? Elliott is trained by Cyclefit, Ben Hallam at Bespoke Cycling and Specialized SBCU. He has worked using both the Retul and BG fit systems. He has been fitted by Scherrit Knoesen (The Bike Whisperer) using the Steve Hogg methodology. We believe this range of experience of different fitting ideas gives an advantageous knowledge base from which to work from. He has previously worked closely with leading fixed foot podiatrist Mick Habgood in assessing the foot, fitting the orthotic and setting the cleat position and foot correction as required to obtain optimum knee tracking, pedal stroke efficiency and rider comfort. We use video capture including Dartfish analysis and 240FPS HD slow motion to analyse the position. The approach is holistic. We look at rider comfort and control at all contact points, pedal stroke efficiency and power and also consider how the position will affect how the bike rides. We think about what you want to do on the bike and set up accordingly. You will not be shoved into a cosy bike fit box, we will do what is best for you, not what some predetermined numerics or rigid fit system tells us. We use Gebiomized saddle pressure mapping in all bike fittings. The system allows us to analyse the relationship between rider and saddle in great detail. This is incredibly useful for correcting asymmetry in the position due to issues at the feet or leg length discrepancies. Even poor or asymmetric pedalling technique can be detected. It lets us objectively select the best saddle for the rider and position it with ultimate precision to relieve pressure issues and discomfort. Crucially it allows both the fitter and the rider to visualise the contact and movement on the saddle. Elliott has a good eye for improving existing fits, particularly with respect to the saddle to cleat connection and shoe/cleat setup. + What are bespoke fitting services? 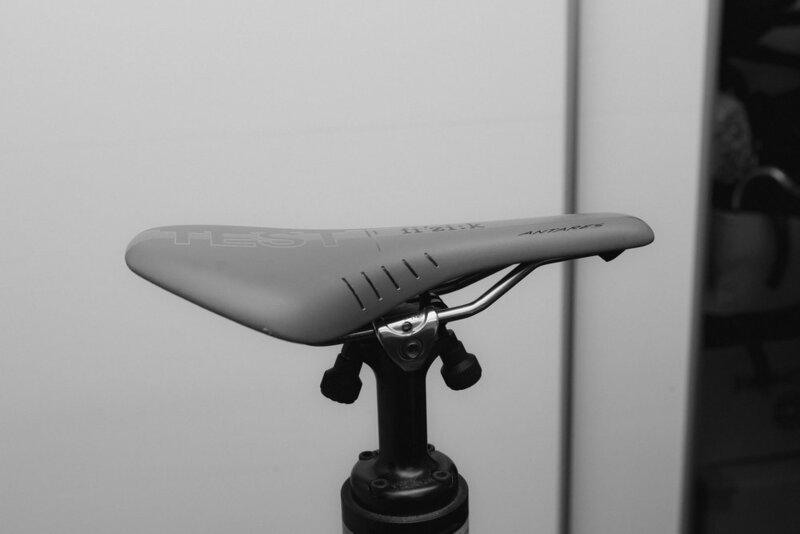 Maybe you are happy with your bike fit but want to explore a new saddle or component and want to make sure your position remains the same with the new part installed. Maybe you want want to look specifically at crank length. Whatever your requirement, get in touch by email or the call back button and we will discuss and give you an idea of cost. + What do I get at the end of the fitting? You will receive a completed form with your before and after bike measurements, any advice for future changes and the results of your physical evaluation. If you like we can forward some of the video to you as well. You will hopefully learn a lot about your body and how it interacts with the bike. Also an understanding of why we changed what we did during the fit enabling you to make adjustments yourself going forward, if you want to. + Will my bike be set to my measurements when I leave? In the majority of cases yes. However we may need to order the ideal parts in for you to be able to complete setup, the bike may need to go in to the workshop to be recabled or have the cranks changed for example. In such cases you can either leave the bike with us to be completed or we will arrange a time for you to return asap. + What fit components do you use? We stock Deda finishing kit as a default choice. We also like and supply Enve, 3T and FSA but can work to your requirements if you prefer something else. If you would like parts of a specific model or colour we can fit a demo part to get you on the road post-fit while we order you in your desired range. We stock Fizik and Specialized saddles and have the full range available to demo. There is a £25 pound charge to try as many as you like refundable against any purchase from us. We stock shoes from Specialized, Lake and Shimano. + What about Retul, that's better right? Retul is a measuring device that collects and presents data for both the fitter and the client to see and use. Ultimately it is only as reliable as the fitter using it and the fitter's skill will determine the outcome, not the system. It's one thing to see a problem and another to know how to fix it. 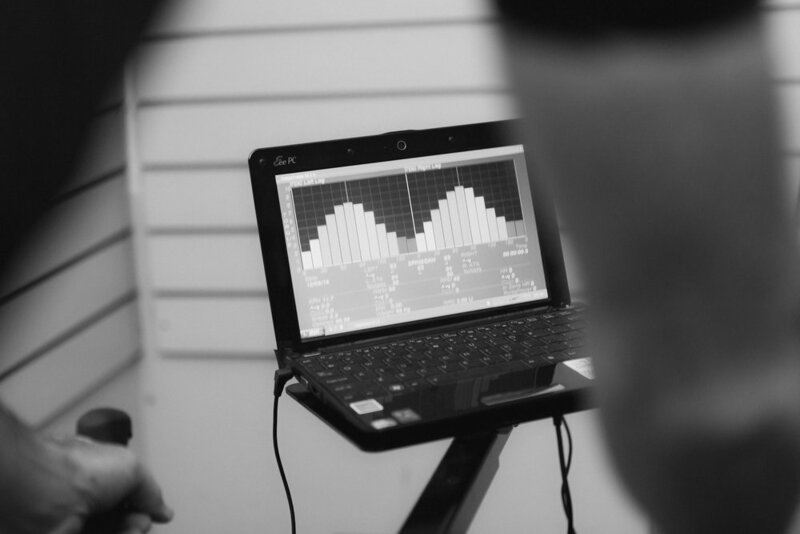 We have done numerous bike fits with customers looking to improve or remedy a previous Retul fitting. Conversely one of the best fitters we know is happy and extremely proficient using it. Elliott has previously worked using Retul and feels he fits better without it. He finds it mostly an unwelcome distraction from looking at the big picture. We will write a more detailed article on this shortly. Why not go back to the top of the page and request a call back or arrange to pop in and have a chat with us? 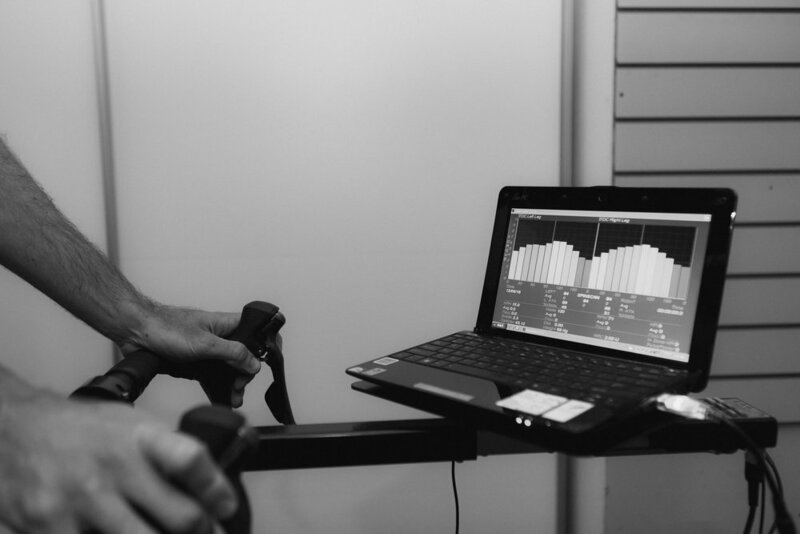 Ultimately successful bike fitting is about the relationship between the client and the fitter. We need to connect and work together. We want to build long standing, friendly relationships. You need to feel that you can trust our judgement and ability to deliver. Sometimes the best way to find that out is to have an old fashioned chat.